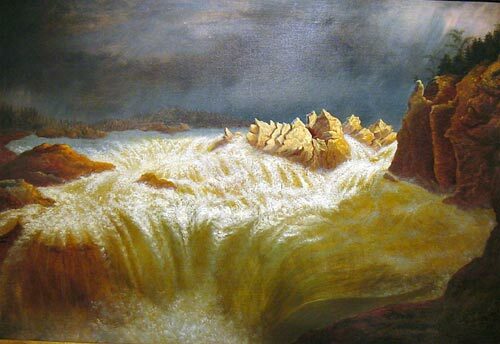 Falls on the Potomac, oil on canvas, 24"x36" image, 28"x40" framed, s.l.r. "J. Hope A.N.A. 1889 Capt 2 VG inf. G. Corp's (? )” label verso indicates painting was in traveling exhibition, "Penn Academy of Fine Art 2/24-12/1971"
Born on November 29, 1818 in Drygrange, Roxboroughshire, Scotland. Moved to U.S. and became known for portraits, landscapes, and historical genre paintings. 1831, moved to Canada. At age 15, he walked to Fairhaven, VT, to begin 5-year apprenticeship to a wagon-maker. After an accident to his ankle, he painted portraiture. 1843, began his professional art career. 1844-46, painted in Montreal. Built home in Castleton in 1851 and began teaching painting and drawing at the Seminary. Landscape artist, Frederick Church, influenced Hope to paint landscapes and move New York City. Hope painted in NY during winters and returned to Castleton for summers. Participated in 11 battles during Civil War. His paintings of battle scenes were well-known. 1872, moved to Watkins Glen, NY, where he built studio and art gallery. During last 20 years of his life, he painted water and geologic formations found in area, especially Rainbow Falls. Also painted White Mountains of New Hampshire. Studied: 1 year at Castleton Seminary. Member: Associate Member of National Academy, 1871. Exhibited: National Academy, 1854; Brooklyn Art Association; Boston; Philadelphia; Buffalo; Cincinnati; Detroit; Utica; Chicago; and St. Louis. In the collection of: Metropolitan Museum of Art; Santa Barbara Museum of Art; Corcoran Gallery of Art; Museum of Fine Arts, Boston; Currier Gallery of Art; Everson Museum of Art; Butler Institute of American Art; Hunter Museum of American Art; and Museum of Art at Brigham Young University.